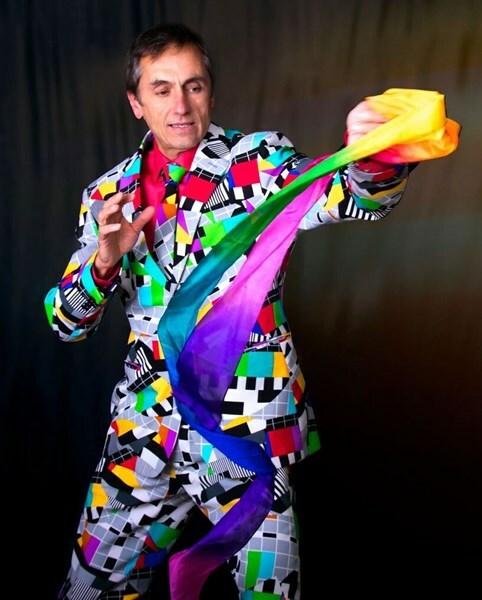 Massachusetts Magician Franc Karpo Provides Hassle-Free Comedy Magic Entertainment That Is Guaranteed To Help Make Your Event Amazing, Dynamic & Fun! Having performed and booked Boston Massachusetts area entertainment for over 5,000 events I know that it can be a real hassle to plan and organize for entertainment. It doesn't matter what event you're planning. Whether it's a child's birthday party, school assembly, sales meeting, corporate event, etc., finding affordable quality entertainment and services that you can count on is almost an impossible task. My name is Franc Karpo. I'm a Boston Massachusetts comedy magician and I've helped make both kids and adults events amazingly fun and successful for the past 25 years. I can help you get the kind of quality entertainment and services that you deserve. Now I can sit here and tell you how great I am, blah, blah, blah. Anyone can do that - it doesn't mean a thing. So I'd rather have you read my customer comments and you'll know that you will feel secure in that I will do an awesome job for your event. You Can Have Results Like These Or Even Better! "Thank you so much for providing such fun, thought – provoking entertainment for our holiday party. You went above and beyond expectations and we are so grateful for the laughs and mysticism you provided. Your use of audience participation was tremendous… it was great to get to laugh at ourselves and better yet, our co-workers. Hands down you beat the canned performance of a DJ or stiff sounds of a band. Many thanks from all of us at Echo Bridge Entertainment." "Thank you so much for coming to Eric and Kevin's birthday party. You are the best! All the kids and parents enjoyed your wonderful magic show very much. Eric and Kevin had both written you a thank you letter which should be in your mailbox soon. As the matter of fact, they asked if they could write you a thank you letter themselves the very next day. I'd be happy to call your testimonial line. Nothing makes me happier than seeing my kids being so happy at their birthday party. You made it truly THEIRS! They will remember you for a very, very long time :)"
"Again, thank you so much!" "Thank you so much for your amazing performance today. I think the parents were in awe as much as the kids were. It was a perfect party and you really had the kids captivated. I'm sure that you will be hearing from the other moms to make some bookings!!!" "Thank you again for making Amber's party unforgettable. The kids and parents loved your show! Amber already asked me if you could come for her birthday next year." P.S. "The goodie bags were perfect! Getting the extra 20 bags from you saved me so much time and it was one less thing I had to worry about." "Amazing! What better word to describe your show. I've been in the pre-school business for 15 years now never have I seen a performer keep the little ones attention better than you. 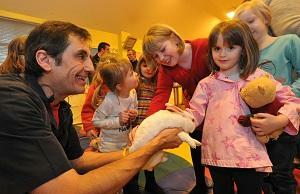 We've had other magicians in the past, but as you know dealing with pre-school age children is a challenge. You far surpassed my expectations!" 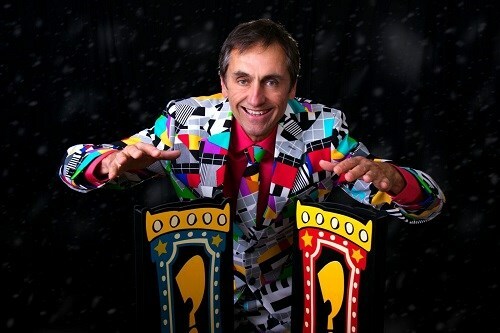 "I want to thank you for your wonderful magic show you gave us at our Centennial Celebration at Hudson Public Library. Everyone just loved it. You have the just the right mix of skills for a group like that, and I could always see a crowd gathered around you. It was a pleasure to hear people laughing and ooh-ing at your act." To make your event sizzle with excitement, contact me here through the Gigmasters form and I'll send you detailed info about how we can make your event the best ever. P.S. Available regions: Boston MA, Wellesley, MA, Newton, MA, Andover, MA, Quincy, MA, Natick, MA, Weston, MA, Worcester MA, Framingham MA, Bridgewater MA, Nashua NH, Manchester, NH, Hartford CT and Providence RI. Franc was great, interactive all along with the kids at the show. All the kids and parents enjoyed watching the magic show. Franc was amazing! He captured everyones attention. I have a one year old and he was mezmorized by Franc!! We all had a great time. Of course the bunny was a hit. Thanks Franc!!! Frank was great he kept children focus on his perfomance, kids and parents were very happy with Franks show. Have a good day. What a great show Franc put on for our children's birthday party! He kept fifteen 5-6 year olds and a bunch of tweens occupied and entertained for the entire show! Everyone, including the adults, had fun! Thanks Franc. The party would have been an absolute flop without you! we all had a great time. franc was a big hit at my party. the guest were very interested, and seemed to enjoy their experience with him. i would definitly hirer him again. Franc Karpo provided fine quality entertainment at our fundraiser dinner event. The audience participation was a big crowd pleaser and kept everyone's attention from start to finish. Everyone had a great time and really enjoyed the show! Thanks Franc! Franc gave a very professional and fun performance at our Halloween party. I would highly recommend him to anyone looking for group entertainment. I was not there personally, but after speaking to Frank on the phone and seeing his email explanations, I was confident he would be great for my son's 30th birthday party. From the reports I have received so far, he was great, awesome, and everyone had a really good time! Thanx. Please note Franc Karpo will also travel to Braintree, Cambridge, Newton, Readville, Brookline Village, Medford, Randolph, Milton, Quincy, Wallaston, Watertown, West Medford, Weymouth, Arlington Heights, Holbrook, Melrose, Nonantum, North Quincy, Waverley, Dorchester, East Weymouth, Hyde Park, Mattapan, North Weymouth, Oakdale, South Weymouth, Waltham, Babson Park, Avon, Canton.